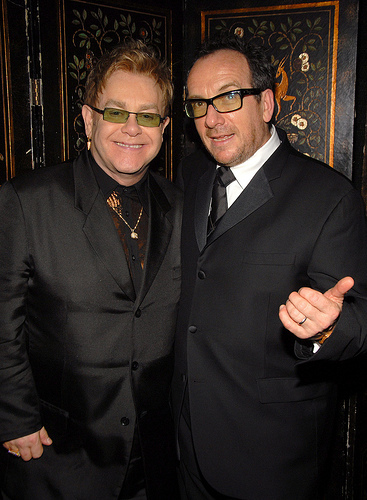 I wonder if this means Sir Elton forgives Elvis for the Vanity Fair article. Two of the most respected musicians in the world will collaborate on an extraordinary new television series. “Spectacle: Elvis Costello with…” will be hosted by its namesake and produced in conjunction with Sir Elton John’s Rocket Pictures. Elton John will be one of the program’s Executive Producers. The series will air beginning later this year, on CTV in Canada, Channel 4 in the UK and Sundance Channel in the US. FremantleMedia Enterprises, will handle sales of the show to the rest of the world. Conceived to provide a forum for in-depth discussion and performance with the most interesting and influential artists and personalities of our time, the show fuses the best of talk and music television. “Spectacle: Elvis Costello with…” promises to be an unpredictable and unprecedented television experience. The series of 13 one-hour programs will feature everything from intimate one-on-ones with legendary performers and notable newcomers to thematic panel discussions, with a variety of performance elements including unique collaborations, acoustic and impromptu “illustrative” demonstrations of the creative process, and some original interpretations of others’ songs by Costello. The program’s eclecticism and depth reflect its uniquely qualified host. Elvis Costello is a Rock and Roll Hall of Fame inductee; a Grammy and Ivor Novello Award-winning (and Oscar-nominated) songwriter and performer comfortable in almost every genre imaginable; a musicologist of formidable breadth and knowledge; a contributor to Vanity Fair Magazine; and a noted wit whose stint as guest host on The Late Show with David Letterman won rave reviews. Consistent with Sir Elton John’s long-standing commitment to philanthropy and music, the series producers have struck an exciting association with the (Product) RED (http://www.joinred.com) campaign created to raise awareness and money for the Global Fund (http://www.theglobalfund.org) to fight AIDS in Africa. Select program excerpts and performances will be distributed in a variety of new media and conventional platforms, with a portion of the profits directed to the Global Fund. “Spectacle: Elvis Costello with…” is a co-production of Rocket Pictures, SpyBox Pictures, Prospero Pictures and reinvention entertainment. Executive Producers are Sir Elton John, Elvis Costello, David Furnish, Steve Hamilton- Shaw, Jordan Jacobs, Martin Katz and Stephen Warden. Co-Executive Producer is Alex Coletti. Previous Post Muxtape is Blowin’ Up!